Working closely with the Membership Manager and Executive Director, the Cornerstone Team assisted in the creation and introduction of a new category of membership for the Steamship Historical Society of America, entitled the Captains' Circle. The introduction of this new member category got underway with the direct mailing of a series of four specially developed postcards featuring historically significant fine steam-powered yachts. These mailings were followed with a 16-page booklet detailing the three levels of the Captains' Circle membership categories. The direct mail promotion was accompanied with information published in a special area of the association website. The website, www.sshsa.org, was designed and produced by Cornerstone in partnership with the extraordinary Internet development organization, Sprintout.com and launched in April 2011. Modern Baking, published by Penton Media, the country's largest B2B publisher, is the industry leader among the nation's bakers. Bakers rely on Modern Baking's Buyers Handbook, a 13th issue, to find resources and information about equipment, ingredients, decoration, packaging and more, to run their business. "We've used Cornerstone Media for more than15 years as the primary graphic designers for our monthly B2B magazine. Every design we get from them is not only superior graphically, but we always get several options to choose from that truly target our market and allow us to push the envelope when we want. Cornerstone Media is more than graphic design  they are true publishing veterans that take the time to learn, know and understand the market beyond the surface. That's why their work, be it a page layout for a magazine or a marketing campaign to appeal to advertisers, is right o the money every time." The Kelly Anne Dolan Memorial Fund, a not for profit 501 c(3) organization, serves as advocate for families with seriously ill, physically and cognitively challenged or severely injured children through information and education. The fund provides financial assistance for needs not covered by insurance to families living in or cared for in Pennsylvania, New Jersey and Delaware. Requests for help are answered with sensitivity and compassion. Help can be in the form of payment of an overdue bill, assistance with the out of pocket expenses incurred with frequent doctor and hospital visits, or even a day of respite and fun for the entire family. The Kelly Anne Dolan Fund has provided assistance to more than 20,000 families through the generous support of individuals and organizations. This new mission brochure designed by Cornerstone describes the involvement and impact of the Dolan Fund and it is proving helpful in raising awareness and funds to support the organizations mission. Sporting a new title and a complete facelift The Steamship Historical Society of America's official member magazine is receiving rave reviews. Formerly titled, Steamboat Bill, the newly designed PowerShips has been updated with a complete new layout and new columns presented with Cornerstone's dynamic graphics. Previously published in black and white, today each issue of PowerShips contains 88-pages all in full color. In addition to the positive reaction from members, the society board of directors and advertisers, Cornerstone's development of PowerShips resulted in printing costs being literally cut in half, providing the society with thousands of dollars in savings. "What a treat to receive the summer issue of PowerShips. Along with the concise editing and powerful sub-heads, I was absolutely bowled over with the bold, professional layout. Wow. It further confirms my impression of PowerShips as the jewel of the crown in the industry. Even after 25 years in the advertising business, I have to say I've never seen a nicer graphic or typographical treatment (a passion of mine), right down to the sub-heads and (especially) the photo layout." "PowerShips came in today's mail and, well, just slap me silly with pleasure  a masterful job!" "I just received PowerShips and it's simply outstanding. From the great cover of the Cangarda's helm and telegraph to the great variety of articles  and I must make special note of the illustrations. You have done a great job ... and that is not hogwash. Congratulations." This non-profit maritime society will celebrate its 75th Anniversary during 2010 and it promises to be an exciting year of activities, as well as membership and financial growth. 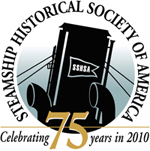 The Steamship Historical Society of America (SSHSA) has signed Cornerstone for re-design and production of the society's official magazine. The newly designed publication will boast a new title, beautiful photographs and illustrations depicting the maritime heritage of powerful ships, legendary passengers and hardworking crews presented in full-color throughout. While the economic downturn has stunted growth of many associations SSHSA membership is growing  and Cornerstone is working closely with the society's management team to generate revenues from sponsorships, advertising and special events celebrating the 75th Anniversary. Cornerstone is the right call for fresh ideas, lower costs and extraordinary results at rates that fit small and medium size non-profit organizations. With Internet technology advancing at a blistering pace it's critical to keep up with the latest in web-based solutions. We have established a partnership with Sprintout Internet Services that perfectly melds cutting-edge web technology with professional graphic design, copywriting, print and online marketing initiatives. We're exceptionally well equipped to build and update your website, create and deliver email marketing programs, webinars and virtual events that get measurable results. Associations are not immune to the economic downturn and must capitalize on all revenue opportunities to survive and prosper. The editors of the Society of National Association Publications (SNAP), a non-profit, professional society serving association and society publications and their staffs, reached out to Cornerstone for answers to some of the toughest issues these organizations face. The resulting interview "Selling the Association Advantage," was published in SNAP's official e-newsletter, "SNAP Online." When it comes to selling advertising, how do you qualify and quantify "the association advantage?" Why should associations allow advertising on their websites? How can you make money off of the digital version of your magazine when you have been offering it as value-added up to this point? Veteran publisher and author Richard Barwis offers up some solid advice. For a copy of this interview, please email: richard@cornerstone-media.biz. 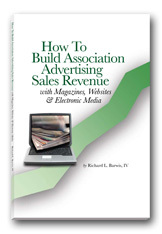 Hot off the presses, "How to Build Association Advertising Sales Revenue With Magazines, Websites & Electronic Media," authored by Richard Barwis, Cornerstone's director, media development, gives specific steps for leveraging print and online media to enhance communications with members and capitalize on revenue opportunities. "How to Build Association Advertising Sales Revenue" is the right remedy at the right time for association executives under assault from rapidly escalating costs, increased member needs and flat or declining revenues. In this book, Richard addresses the outdated bias against association website advertising and encourages associations to capitalize on their intellectual capital, adopt emerging communication technologies, and keep up with the times  or risk being left behind.